VitaPulse Review: Does This Antioxidant Work? VitaPulse is a supplement which contains CoQ10, NAC, and PQQ. Marketing for the product implies that it may help cholesterol levels and heart health. While these claims have not been proven by studies, there is some evidence that the ingredients of VitaPulse may offer a variety of health benefits. Results are highly subjective, and the ingredients can be purchased individually at local retailers, although VitaPulse offers the convenience of these ingredients in a single pill. 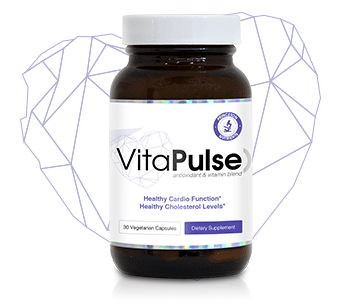 VitaPulse is an advanced antioxidant formula which is said to help support a healthy heart and circulatory system. There is a generous 90-day money back guarantee, which will refund the entire cost of your purchase. Refunds can be obtained by contacting the company at 866-427-3019 or emailing [email protected] Note that shipping costs are not refundable. Although some consumers have said they had difficulty reaching an attentive customer service rep, online representatives for the company have proven to be quite responsive and helpful. Other ingredients include Silica and Vegetable cellulose. There are two ways to ascertain whether or not a product such as VitaPulse works: User reviews, and studies of the individual ingredients. Because user reviews can be subjective, and in some case planted by those with an agenda, it may be wise to consider studies of the primary ingredients and align them with the claims of the product’s marketing. The Mayo Clinic offers an excellent summary for the tested benefits of CoQ10. It lists the over 50 uses for CoQ10 that are described as “unclear scientific evidence”: Among those listed are coronary heart disease and heart attack. A quick list of potential uses for NAC includes a large list of possibly effective uses, including (but not limited to) chest pain, bronchitis, COPD, kidney disease, heart attack, and flu. It would appear that the three primary ingredients of VitaPulse are popular choices, and have at least some studies which show their effectiveness, although cholesterol health does not seem to be a significant use for any of these ingredients. Culling potential side effects from the three ingredients listed above, and from user reviews, it appears that nausea, heartburn, insomnia, headache, and fatigue are among the most common complaints, although side effects of each are generally considered to be minimal. There are challenges when attempting to review a supplements which is said to increase energy, reduce anxiety, and increase metabolism or mental sharpness. These statements are highly subjective to the individual, and perceived benefits can run the gamut from user to user. As stated above, there are studies which indicate that each of the three ingredients show promise in a wide variety of areas. When reading reviews of various CoQ10 supplements you can find almost any ailment reported to be cured or diminished by various users – even those which aren’t typically associated with CoQ10. Thus, subjective reader reviews are only of limited benefit. Moreover, planted product reviews are rampant in 2016, as are reviews in exchange for free products – which many believe can influence a reviewer’s final opinion. Reviews found on the product’s own website are also of limited benefit because we don’t know how legitimate those are, or whether or not negative reviews were filtered out. Our testers here at Epic Reviews have tried a number of supplements in recent months, and – as reflected in virtually every supplement review online – the results range from “It didn’t work,” to “I had more energy.” That is going to be the mantra for virtually any supplement you find online, including VitaPulse. The information available about the primary ingredients does not indicate that LDL levels be improved, nor that this combination of supplements will prevent heart problems. There are, however, a number of benefits which are indicated by initial studies, and this is probably enough for most consumers to try out such a supplement. With that in mind, you will almost certainly want to try the ingredients yourself – whether via VitaPulse or another product – and should focus your attention on the vendor from which you are purchasing your supplements. VitaPulse is available via the official product website, PrincetonNutrients.com, which was only registered in May 2015. That means it is a relatively new online presence. The product is promoted by Dr. Arash Bereliani (although, interestingly, his first name is not mentioned on his bio page), who is a highly-rated Beverly Hills doctor. Princeton Nutrients LLC has improved its BBB rating significantly in 2016, up to an “A-” as of September of this year. Pro tip: Take VitaPulse about 30 minutes before eating to allow for optimal absorption. Of course it could be argued that VitaPulse offers more convenience by including all of the above ingredients into a single pill. VitaPulse is a supplement which contains CoQ10, NAC, and PQQ. Marketing for the product implies that it may help cholesterol levels and heart health. While these claims have not been proven by studies, there is some evidence that the ingredients of VitaPulse may offer a variety of health benefits. Results are highly subjective, and the ingredients can be purchased individually at local retailers, although VitaPulse offers the convenience of these ingredients in a single pill. Consumer reviews for VitaPulse are generally positive. If you’ve used VitaPulse, please give it a star rating and comment below. Another snake oil sales man. WASTE of $$$. Another con artist on the Internet. AVOID, buyer beware. Another way to waste your money. Hello, my name is Veronica and I am the Customer Care Manager at Princeton Nutrients. I am so sorry that you had an unpleasant experience with our brand. I want to take the opportunity to make it right for you. Please contact me at [email protected], at your earliest convenience, so that I can learn more about your situation and make it better right away! Thank you. I’m going to try Vita Pulse. I believe it can work for me. All the reviews that I have read have forgotten to mention that Vita pulse is in an acid resistant capsule therefore giving you the most out of the ingredients by bypassing the 90% ingredient dissolving in the stomach acid. Are the individual ingredients in acid resistant capsules? probably not, and your only going to get 10% of the ingredients which is not going to do anything. This also is the same for those who are saying that to have effect the ingredients needs to be higher. well, again with the acid resistant capsule, you don’t need the higher dosage because 100% of it get’s past your stomach and into your intestines where the ingredients are drawn into your blood stream and distributed through out your body. Take some notes next time huh! It is obvious that vitapulse wrote this review. In my opinion, some of the agents contained in this supplement have not been disclosed. I have not found any evidence that a full pharmacological analysis of this product, by a qualified, independent laboratory has transpired. Therefore I personally would not consume a substance whose complete formulation, is to me, unknown. While it may help a bit like any other supplement...I feel like I'm getting ripped off because I can buy these supplements from the store or even better purchase organic foods. Another hyped product that says it works yet doesn’t prove anything. What does that tell me? It tells me this is yet another attempt by sellers to make millions off of ignorant gullible people who are actually very sick with many problems and just about any “magic pill” on the market will work for them! The best thing to do is change your lifestyle and eating habits while exercising. Hello Maria, my name is Veronica and I am the Customer Care Manager here at Princeton Nutrients. I want to apologize if you fee that you were ripped off by our company. Princeton Nutrients always strives to deliver the highest quality supplements and the most reasonabley possible price for the consumer. We always intend to provide our customers the best value possible. If you are unhappy with your purchase of Vitapulse, we always stand by our 90 Day Money Back Guarantee. Please email me directly at [email protected], and Ill be happy to process a refund for you. Thank you. I am a total un biased individual that has chronic high cholesterol and is HIGHLY allergic to all statin medicines. i took Vita pulse for 3 months and i actually saw i dramatic change in how my bad cholesterol dropped! only concern i know have i have developed muscle spasm and i don’t know if i have developed this from the long term use? I truly believed it help me drop my bad levels! Yours is the most uncharitable, judgemental comment I have read all night! I will be 70 next birthday, am in good health, get LOTS of exercise (work on a construction site during the week, rock-climb two nights a week, run my own tree felling and pruning business on weekends), and eat a high calorie, high protein, healthy diet. I sleep well every night and can’t remember the last time I took a day off sick. So why would I be interested in a product like VitaPulse? Because I intend to STAY that way – for a long time to come! A pinch of prevention is worth a pound of cure. When you consider the possible alternatives, VitaPulse is cheap prevention. Wish I would’ve read this review before placing an order that was NEVER RECEIVED. They take your money and forget about trying to get a live person to talk too. Emails go unanswered. SAVE YOUR MONEY!!!!!!!!!!!!!!!!!!!!!!!!!!!!!!!!!!!!!!!!!!!!!! Hello Mark, Veronica here with Princeton Nutrients. I am so sorry to hear that you never received your package. That is truly very strange. I will gladly ship out a new package for you, free of charge. I want to ensure that you are completely satisfied with Princeton Nutrients. Please email me directly at [email protected], so that I can take care of this right away for you. Thank you. My entire comment regarding Princeton Nutrients was just erased. Princeton must be running this site too. Not erased, just moderated! We have to check all comments first due to spam. Thank you for your input! I am going to try this supplement . My name is Rodney. I live in Lincolnton, NC. Several months ago I listened to that video that went on and on and on and on (over a half hour) before I got to the point where I could actually reach the order form. That infuriated me from the start, but I DID order one bottle of this snake oil. After waiting nearly two weeks without receiving my order, I finally called Princeton Nutrients and was told the product had been oversold but a new shipment “just came in” so mine would be forthcoming. Finally got the bottle of magic potion and took it to my pharmacist to see if there could be any interference with my current prescription meds (Metformin, Amlodopine, Lovastatin, Metoprolol and Methotrexate). My pharmacist researched the ingredients and discovered that there was NO information available for one of the three listed ingredients. I called Princeton Nutrients again today, and the “customer service” reps are totally without a clue with regard to the medical implications of their products. They also refused to put me in touch with the “famous” medial doctor that supposedly invented this product. They further refused to call my pharmacist to discuss the “mystery” ingredient. Therefore, I am finished with Princeton Nutrient and the world famous Beverly Hills Doctor Arash Bereliani. As far as I am concerned, he’s a fake and is getting richer by the day selling products with no verifiable tests or studies to prove his claims. Just another scheme like the nighttime TV commercials for all the other miracle potions and products endorsed by losers like Larry King, Brett Favre, etc. P.S. I have NOT used any of this product, and will not until I know it is safe. If you save your money, you won't get ripped off. I am a physiologist with a PhD and additional qualifications in clinical nutrition. For the past 25 years, I have been speaking out and denouncing quackery and health misinformation. When it comes to dietary supplements, you simply cannot sell them without being deceptive and manipulative with marketing. In my experience and in clinical research, perhaps only 5 to 10% of supplements on the market have legitimate evidence to back them up. The rest rely on deception by omission. The hallmarks of quackery include claiming some miracle breakthrough by some doctor no one has ever heard of, using testimonials from high profile people (whether real or not), and lots of average Joe testimonials. This product appears to use the same marketing puffery. Buyer beware. Wold you please provide your full name and credentials. I’ve been taking the supplement for about a month now and have noticed a huge difference in my energy level and feel cognitively more alert. Iam a RN and will continue taking the supplement and am considering the novalite. I received my vitaplus within 7 days and have absolutely no negative experiences with this company! I wake up happy and energetic. I love it. I didn't expect this reaction and wonder if there is a stimulant in it. I have pain in my abdomen and bowel. I don't know whether VitaPulse is the cause but it came on when I started. I have taken Vita Pulse for 1 month. I have never felt happier or more energised. Love it. Continual pain in my abdomen so will have to stop taking it to see if it is the cause. This seems to give me more energy. It definitely has reduced the swelling in my knee. I injured my back and had back surgery in September of 2015. Vita Pulse has helped my back immensely--not as much pain throughout the day unless I am bending and lifting too much. I first had a rash reaction on my eyelids then a rash reaction all over my torso. The rash on my eyelids went away after a few weeks then returned again. I have continued to have spotted rashes on my body. I really like this supplement because it seems to help me so much and hope that the rashes eventually go away never to return. Can anyone give me any info or advise on this? Product made me jittery, feeling like I was light-headed, like having too much coffee…I stopped taking it. I am a 48 year old IT tech so I spend a lot of time sitting and don’t exercise as I should. I am about 10 pounds over weight 5′ 10″ at 170 lbs. I have been taking for about 4 months and actually stopped and stared a few times and do feel that I feel better.